I remember being shocked at the news of Robin Williams’ suicide just over a year ago. The world lost a great talent. And when someone so talented and successful chooses to take their own life, it can be difficult to understand why. 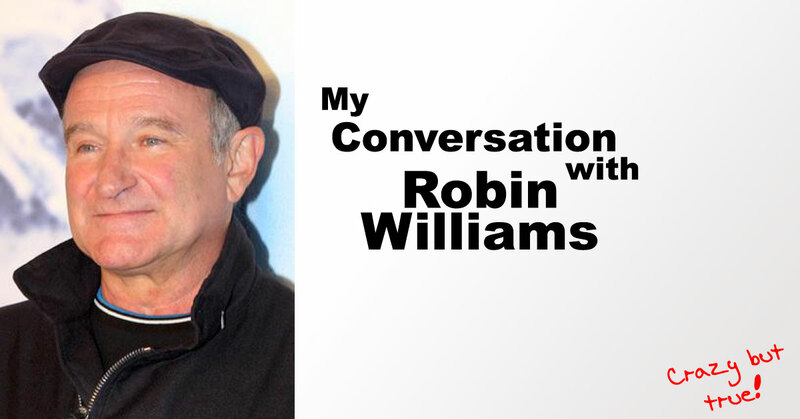 My conversation with Robin Williams only made his loss more difficult to understand, because he shared such an important lesson with me about enjoying life and building your own success. But before I share my memory of that conversation with you, I have to tell you about Tuesday night. I was in a celebratory mood on Tuesday. I’d returned from San Diego (Carlsbad, CA to be precise) to Myrtle Beach, SC, after attending Frank Kern’s exclusive training event with my friends Ken Hardison and Billy Fansler. You don’t know what you don’t know, as Ken says, and we learned so much in 2 days with Frank before locking ourselves away in a hotel suite for another 2 days to implement what we’d learned. I was excited about what the results would look like and so was Ken. So when Ken suggested I stop by their local bar to meet him and his wife Terry, it was hard to refuse. My big mistake was not eating much except a yogurt with granola the entire day. Couple that with the exemplary service of our server, BV, and it was inevitable how the day would end. After barely making a dent in my third drink and sending it away, I said to Ken and Terry, “Please take me home.” Actually, I had to say it three times before they realized I was serious! I zig-zagged backwards, away from the house, before finally gaining my sense of direction. They practically had to roll me through the front door. Now folks, don’t believe for a second that this is a usual Tuesday night for me. It is only the third time I have ever been that drunk. I remember the previous two times very clearly. As much as alcohol can affect the memory, it’s isn’t really that amazing how making yourself so sick can stand out clearly in your mind. I know I hit the pillow around 12.25 am, because the next morning I saw that I had sent a text to Billy at 12.24 am, telling him (with perfect spelling, punctuation, grammar and expletives) what a total mess I was at the time. What was so amazing was that, without an alarm set, I was awake at 7.20am. Really, it’s not fair or right that my 147 lbs. of lean, mean, marketing machine can be so ‘with-it’ after so much alcohol and so little sleep. The secret to overcoming a hangover is coconut water and some Ibuprofen (ideally both taken before heading for bed). And this was no major hangover, truly unbelievable for what I’d put myself through the night before. Like I said, not fair or right. The universe was smiling upon me. But what about that conversation with Robin Williams? And what the hell does that have to do with getting drunk? Well alcohol does some strange things. And the dream I had Tuesday night was beyond weird. I dreamt I was back in time. Well it had to be that, because Robin Williams was still alive. And we were having a conversation. When I woke up on Wednesday, I couldn’t get those 6 words out of my head. It was all I could think about as I made coffee. Robin Williams had given me something that would take me the rest of the day to get my head around. When I understood what Robin had shared with me, I knew I had to share it with you. We all have our dreams and goals. I want to make my business more successful and give myself the freedom to live every day like a paid vacation and only do the things that energize me. Thinking about goals and dreams doesn’t make them happen. You have to start living the dream, working towards your goals. You have to take action. Live it. There is always something you can do to improve, yet success is in the mind. You have to know what you can achieve and feel that in yourself to go out and make things happen. I have to thrive off the energy that each success brings me, but I also have to know that I have that success in me, even before I see the result I know I can create. Feel it. Success doesn’t come by accident. Athletes and sports stars like football players and champion golfers don’t win by accident. They have to train and work every day at what they do to become the leaders in their chosen profession. When they win, it’s not like winning in Vegas which is nothing more than a gamble. To be successful, whether in sport or business, winning means earning every single step of progress, and taking energy from each win. Win it. It may only have been a dream, but the six words that Robin Williams shared with me as his secret to success will never leave me. That’s a well written crazy story with good advice. 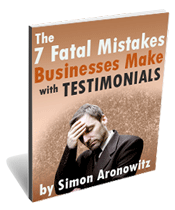 Thanks Simon I did not know you had it in you. You keep on coming up with some great surprises. Keep it up! – David – speak soon!